Today, we’re going to share our top picks for the best DSLRs for video recording! We found 10 cameras that are perfect for shooting your child’s sports games, important family events, and your latest vacation highlights. There are so many great cameras out there with a variety of cool features that it can be overwhelming to choose! Before we dive into the product reviews, here are a few features to focus on when looking for a camera that shoots video. Flip Out Screen: A flip out screen can be convenient for a variety of situations. For example, they’re great for shooting videos of you! You can check lighting, focus, color, and more without needing to go back and forth to the camera’s viewfinder! Capture Resolution: The capture resolution lets you know the quality of the video you are recording. 1080p is the most common HD recording quality, and it produces 1920x1080 pixel video. 4K is a super high-quality HD that produces 3840x2160 pixel video. 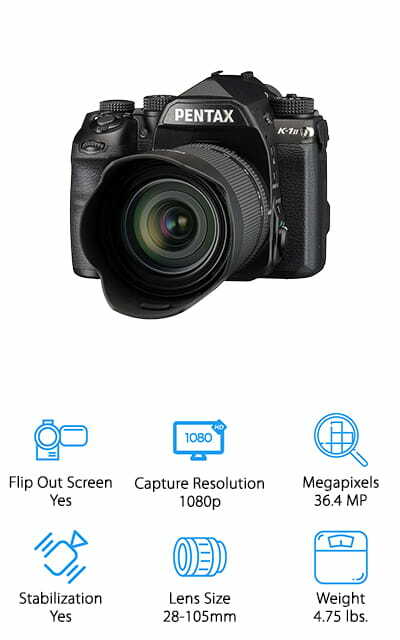 Megapixels: In addition to the video capture resolution, we’ll also let you know the megapixels for each camera. Higher megapixels mean higher video and photo quality, whereas lower megapixel cameras can still shoot great video while typically being more budget friendly. Image Stabilization: If you plan on shooting in low light areas, using a telephoto lens, or worried about your camera shaking while you hold it, image stabilization can help! It helps to minimize vibrations and shaking while shooting for clear, crisp movements! Lens Size: We’ll let you know what lenses come with each camera, so you can buy the right one for you! Many kits we reviewed come with more than one, which is great if you don’t already have a variety of lenses! Weight: The weight we’re referring to is the camera and any accessories that may come with it. We found lightweight cameras that are easy to hold for long stretches and all-inclusive kits with everything you need for a professional quality shoot! Now that you know what DSLRs offer, let’s find the right one for you! We did the research for you and found 10 cameras that shoot beautiful photos and HD video. There are inexpensive models for beginners, full kits with all the accessories you need to get started, and tricked-out cameras when you’re ready to invest in an upgrade. If you’re short on time, start with the Top Pick and Budget Pick, and then come back to read the rest! Our Top Pick is the Canon EOS 5D that shoots 4K UHD DSLR videos in even the most challenging situations! This camera topped our list because it shoots beautiful, crisp video in 4K at up to 30 frames per second. It shoots incredibly high-quality video with a large frame, and you can take stills from the video as well! 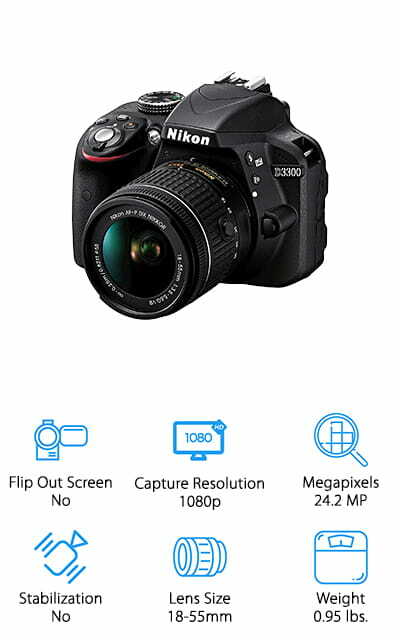 We also like that this camera has an ISO range of 100 – 32000, making it great for shooting in low light areas without graininess or quality loss. It’s also Wi-Fi capable, so you can connect it to your smartphone and use as a remote control or use the GPS tool to tag your location on your photos or videos. The touch screen auto-focus is also nice – you can change the focus with the touch of a finger! This is the best DSLR for video shooting because it’s easy to use and produces incredible videos without needing a lot of training! 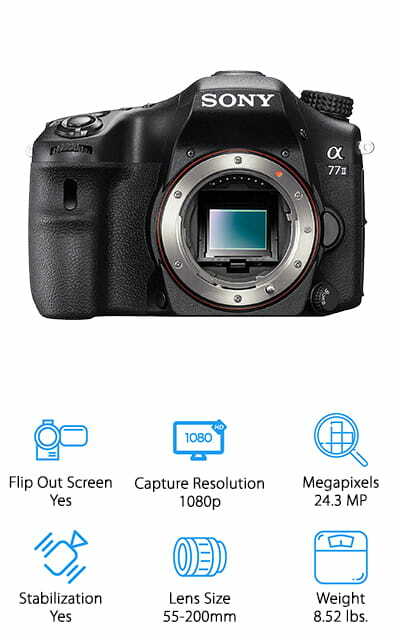 If you’re looking for the best DSLR for shooting video that won’t cost you a small fortune, the Lumix G7 from Panasonic is a great camera for photographers on a budget! Our Budget Pick camera shoots 4K videos for incredibly crisp, clean video – even with lots of motion or in low light. Because this is a compact digital camera, it’s also lightweight, which is great for long days of shooting video of nature, kids sporting events, travel photography, and more! You can also play back your video and capture individual stills to turn into photo files, so you don’t miss that perfect moment while you’re shooting! We also like that the camera functions are intuitive, making this a great camera to invest in if you’re new to photography or HD video recording! We think this would make a great gift for a young, budding videographer in your family – or get one for your next vacation to capture your favorite moments! 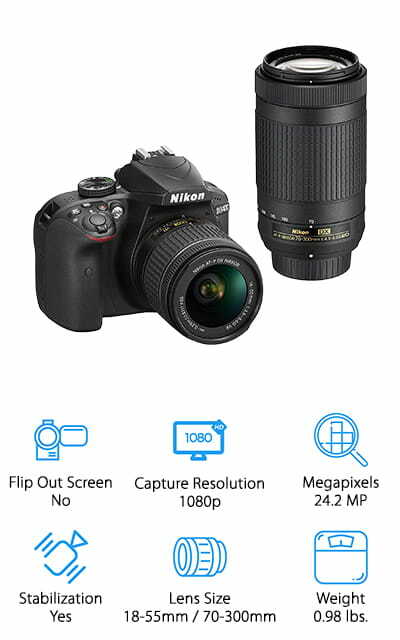 Next up is the D5300 from Nikon, a well-trusted brand in photography – and for good reason! This camera is another lightweight model that you can take with you anywhere without weighing you down. The functions are easy to master, and shooting video on it is incredibly easy. Its intelligent design allows you to shoot video in a variety of situations, and it will set the focus, ISO, and other settings for optimum recording if you choose to use it! We also like that it comes with a flip-out screen, so you can record yourself or shoot selfies with ease. You can also share video and photos online, thanks to it being Wi-Fi compatible. This set comes with 2 lenses, so you can shoot close up or at a distance – no need to buy extra lenses! This is the best DSLR for HD 1080p video recording because it’s easy to use, lightweight, and comes with everything you need to get started! Are you interested in photography and HD video recording, but you’re starting from scratch? Don’t worry – you don’t have to spend a lot of money to get a complete starter kit! Consider picking up this 27-piece kit from Canon that has everything you could possibly need to get started! 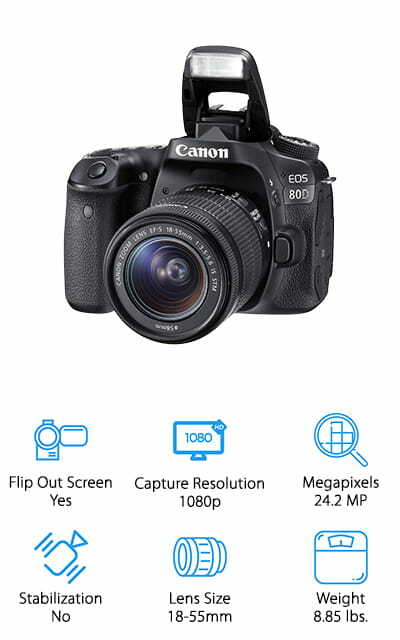 The camera is a Canon T6 EOS Rebel, which shoots beautiful 1080p HD video, and this 18-megapixel camera shoots clear and crisp photos too! It’s Wi-Fi capable, and the functions are easy for beginners to learn – or use the preset functions to point and shoot on the fly! The kit comes with all the accessories you need to get started, so we think this is the best DSLR for videography that beginners will enjoy! It comes with 4 lenses, 3 filters, a full sized tripod, tabletop tripod, remote control, extra batteries, and a whole lot more. There’s also a nice padded carrying case to keep your camera protected while you’re traveling! On our hunt for the best DSLR for HD 1080p video recording, we came across this 14-piece kit that’s perfect for those of you who love to travel! This kit has everything you need to take high-quality photos and video on your next adventure, including a 64GB memory card, SD card case, battery charger, UV lens cover, and more! Oh, and everything stays neatly organized and well protected in the travel case that comes with it! The camera takes 24.3MP photos and 1080p video, and it has a silent auto-focus feature, making it great for taking photos of nature. You don’t have to worry about the focus noise distracting wildlife! 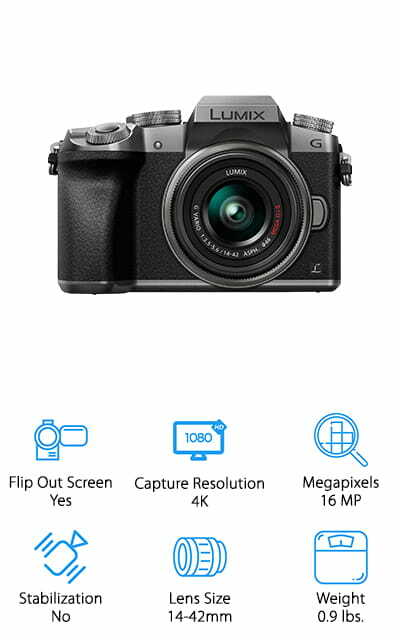 It also has a flip-out screen, so you can see what you’re shooting in awkward spaces, review images and video, or take selfies without worrying they won’t turn out right! We think this would make a great starter kit for your next vacation – just pack it up and go! What is the best DSLR for taking videos if you’ve never used one before? This is a pretty common question for people new to videography, and we found a great camera from Nikon beginners will love. The D3400 is made for convenience, while still offering amazing image and video quality. We like that this camera is incredibly easy to use, with an intuitive interface, easy to read buttons and automatic settings that work in a variety of situations. It shoots full 1080p video you can easily transfer over to your smartphone or smart device to share with friends. We also like that this camera is incredibly lightweight, so you won’t need a tripod to shoot for long periods of time. The camera is great for beginners because it’s inexpensive, easy to learn, and shoots impressive photos and videos to show off your new skills! This kit also comes with 2 lenses to get you started, which is a great deal! Once you’ve mastered your current camera, and you’re looking for an upgrade, the K-1 Mark II from Pentax is worth every penny. 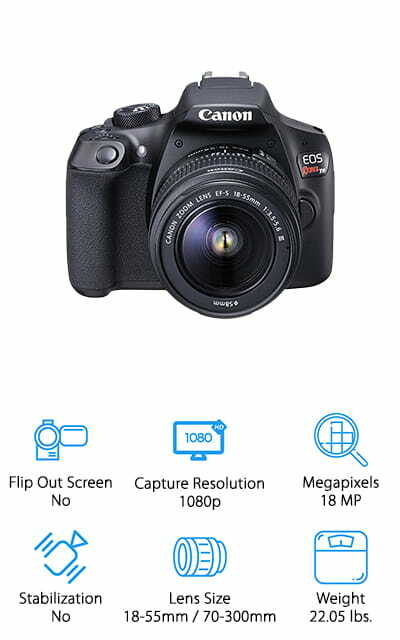 This 36-megapixel camera takes professional quality photographs that you will be proud to share. It has a pixel shift resolution function that takes 4 photos rapidly and then compiles them together to create the most colorful and crisp photo – even in low light or tough conditions. The weather-resistant camera is also great for taking out into the wilderness to capture nature photos and video. The full HD video is also enhanced with image stabilization, autofocus, and a whisper quiet motor that won’t startle wildlife or distract human subjects! The tilting screen makes it easy to shoot in awkward spaces, and the optical viewfinder makes it easy to set up your shot exactly how you want it. If you love being out in nature, this is the best DSLR for video capture of your favorite animals and landscapes! Another great kit for someone who loves to take their camera everywhere they go is this 20+ piece kit from Canon that has everything you need to shoot HD video on the go! We like that this kit is specifically designed for video, with a full microphone you can attach to your Canon EOS 80D to capture the best audio in addition to video! We also like that this camera comes with a variety of lenses and filters, so you can capture the action exactly how you want it to look! It all stays organized in the travel backpack that’s included! The camera is also a major plus for this kit. 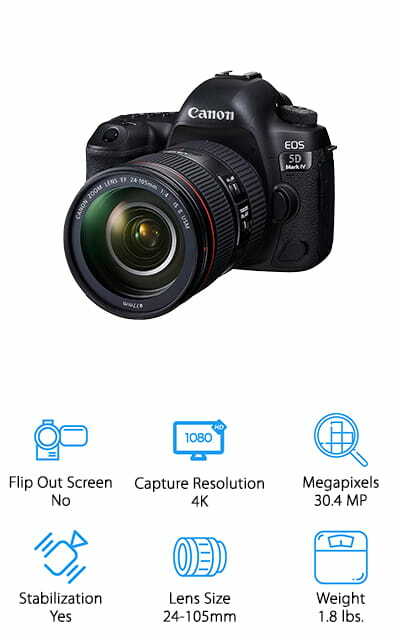 This 24.2-megapixel camera shoots beautiful photos and full 1080p video, and it has an ISO range of 100-25,600 to shoot photos and video in low light! The flip-out screen makes it easy to review images, and it’s Wi-Fi capable to share what you’ve just shot with friends and family! If you want to take an inexpensive camera with you on your next vacation, the Nikon D3300 shoots great HD video and photos without spending a lot! 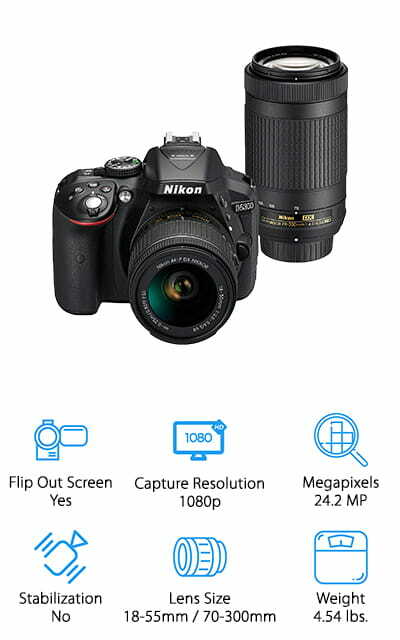 This 24.2-megapixel camera shoots beautiful photos, with an ISO range of 100-12,800. You can shoot on a sunny beach or dark rainforest without sacrificing quality! It also shoots high-quality 1080p video with sound, so you can capture the moment with stunning clarity and color! It’s also Wi-Fi compatible, so instead of carrying around a bunch of memory cards while traveling, simply transfer photos and videos to your smartphone, tablet, or laptop to store them or share with friends! No worries about losing those tiny memory cards! We also like that this camera’s functions are simple and easy to use, and it’s also incredibly lightweight, so it won’t drag you down or add too much weight to your luggage! This affordable camera will be a lot of fun to take on your next adventure! 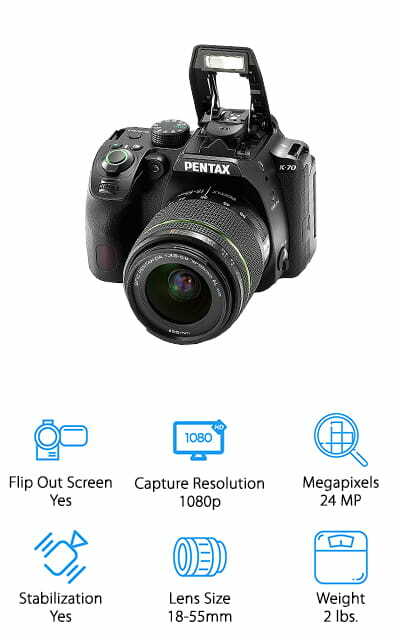 Last up in our search for the best DSLR for video recording is this rugged, travel-friendly camera from Pentax! This 24-megapixel camera is made for taking outdoors, thanks to the weather-resistant and dustproof body with a flip screen that allows you to view videos and photos at whatever angle is easiest. You can also adjust the brightness of the LCD screen for better viewing in low or high light. To shoot in terrible weather conditions, you can also rely on the image stabilization and shake reduction functions to help you get crisp, clear photos and video – even if you’re a little shaky due to the wind or cold! The buttons and dials on the camera are even optimized for use with gloves, so no worries about freezing fingers in the winter! We also like that you can use Wi-Fi to sync it to your phone, allowing you to view live video feeds, change settings, and upload photos to social media!